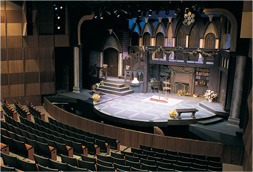 The Theatre Group at Santa Barbara City College performs in the two newly renovated, best equipped and most audience friendly theatres in town. 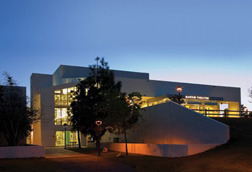 Located on the beautiful West Campus of Santa Barbara City College and overlooking the exquisite Santa Barbara Harbor, the newly renovated Garvin Theatre is a spectacular place to see a play. Re-opened in the spring of 2012 after an extensive three year renovation project, the Garvin Theatre features all new rigging, lighting and sound systems, and a re-designed audience chamber with improved acoustics, comfortable new chairs, and handrails on the aisles. Situated on a comfortable incline, each of the 370 seats comes with a clear, unobstructed view of the stage. 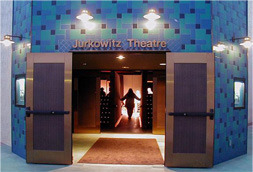 The Jurkowitz Theatre is a theatrical jewel and an audience favorite. Extensively remodeled in 2002 and updated in 2012, The Jurkowitz Theatre is a 100 seat black box theatre that is both cozy and luxurious, and provides a home for plays that require an intimate atmosphere. Due to the nature of the theatre, no late seating is allowed, so please plan to arrive early. Outside the audience chambers, visitors will find an expanded upper lobby with a luxurious new concession area. A grand new lower lobby is both beautiful and practical, providing a covered entryway to the Jurkowitz Theatre and lower seating areas of the Garvin, greatly improving accessibility for all audience members. 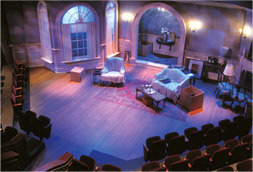 Seating for Patrons in Wheelchairs is plentiful, easily accessible and located in the heart of the audience chamber in both theatres. Assisted listening for patrons with hearing-impairments is available for all Theatre Group performances and live-captioning is available at selected performances. (Check with the Box Office for schedules). Parking is free and located near the theatre in well-lit, well-maintained lots. Bus transportation is also available to the theatre. (Check MTD schedules for times). The Box Office is located just outside the Garvin Theatre Lobby and is open Monday through Friday, 10am to 5pm, and on Saturdays when there are performances from 12noon to 5pm. The Box Office also opens 1 hour prior to each performance. There is a 15 minute green parking zone in the turnaround near the theatre for purchasing tickets. Call 805-965-5935 for information or reservations.